Are you just by your self ? Then book 2 spots or contact us to see if we can squeeze you to another lesson on the next day. Grab a trainer and learn while you fly. No matter what level you’re at, we will teach you mastery of the wind window, the key to sport making your next step a breeze. Scheduled lesson times 9am 11am 1pm 3pm 5pm. Bookings recommended. So you want to kitesurf? Then this is the lesson for you. After rigging an inflatable kite move straight off the beach and learn all the skills to fly your own kite hooked in and body dragging the key skill before the board start. 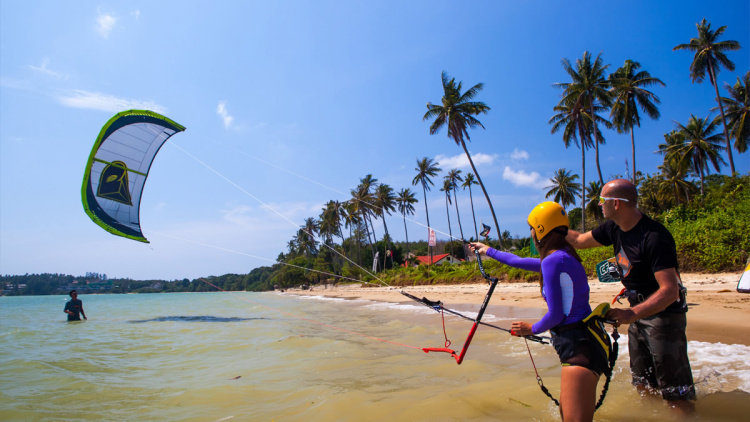 Using the right size kite for the conditions and your body weight you’ll learn rigging launching and landing letting go for depower and safety, water relaunching, self rescue and body dragging before the board. will have you practice skills learnt in your previous session plus more kite control up-wind body dragging and then the board start and riding. This lesson focusses just on your riding including edge control, turning, stopping, staying up wind and your first Jump! And your first Jump ! These lesson are normally one on one 2 hrs or can be done as group of up to 4 students requiring extra time to get competency.